Alright you guys, I guess I have a bone to pick with cooking bacon. A. Cooking it in the microwave is a mess (no plate is big enough for raw strips) and the bacon gets all tough and funky. B. 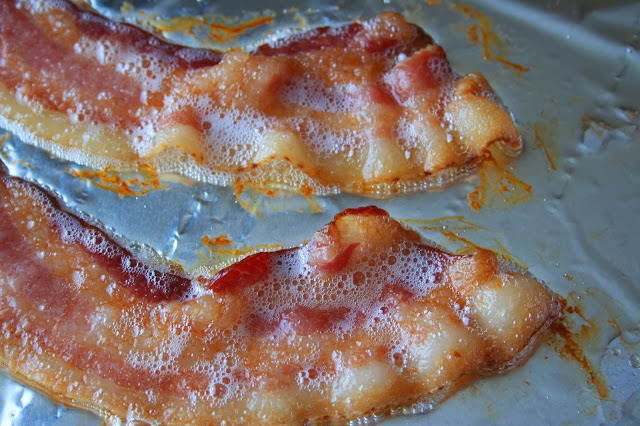 While frying it a pan produces the most flavor (if you use the bacon grease), it spits, splatters and takes a long time to cook. Oh and it's a pain to wipe all the grease out of the pan. 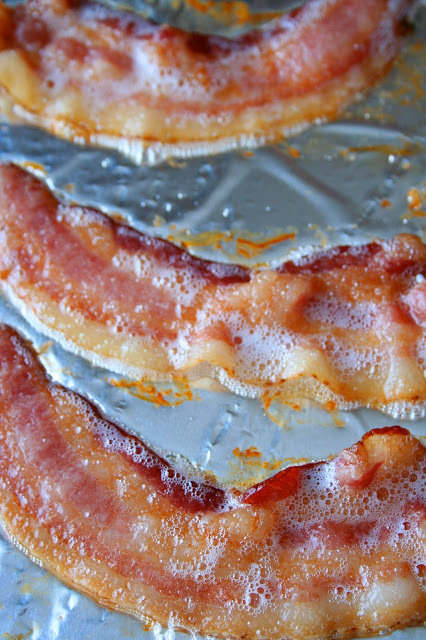 C. I have finally found a way that I love to cook bacon without all of the mess and babysitting. Oh and it produces the best result...baking it in a good old conventional oven. 2. Line a baking sheet with a sheet of tin foil for easy cleanup. Lay the strips of bacon on top of the foil and bake for 15 to 20 minutes or until bacon is crispy. Dry on paper towels and serve.